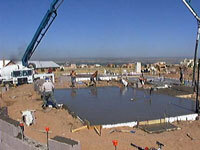 Sunlight Homes Provides and excellent construction diary of the homebuilding process. Within this diary is excellent information on building a foundation with insulated stemwalls and radiant heating. Listed here is the foundation construction process. Installing polystyrene blocks for pouring insulated stemwalls. Cold migrates into the home through the stem walls and slab if the stemwalls are not insulated. Plastic tubing is laid for the radiant heat. The location and density of the tubes correspond with the space it will be heating and the finish flooring to be used. The site is cleaned up and prepared for the framing crew.